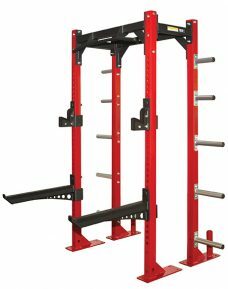 PATRIOT SPORT TRAINING RACK WITH MONKEY CHIN BAR - Rae Crowther Co.Rae Crowther Co.
Patriot Racks are made from 11 Gauge structural 3” steel tubing. The uprights are lasered 1”-1/8 holes that allow 2” bar catch adjustments. Numbers are laser cut on both sides of the uprights. Lasered numbers will not wear out like panels or decals. Each upright has 16” x 6” x 3/8” welded base plates. 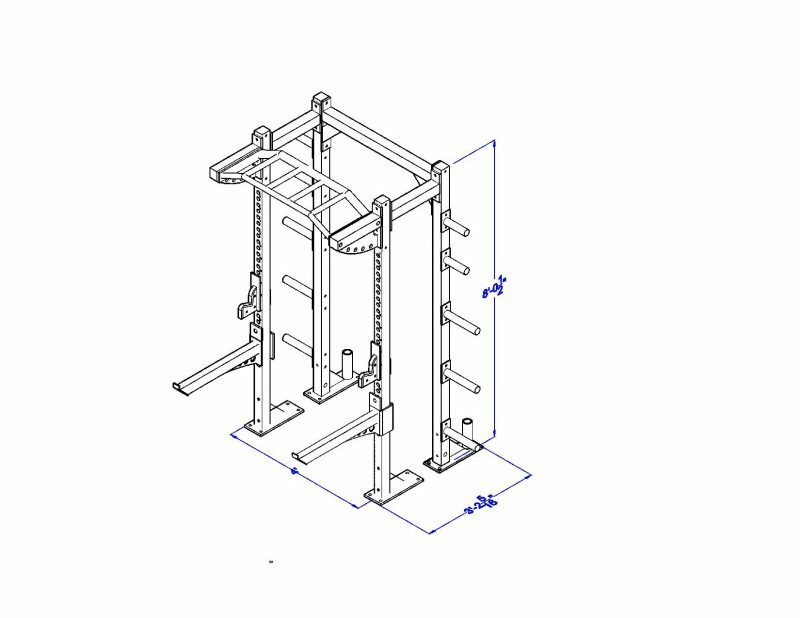 All base plates have welded gussets for strength. Each base plate has 4 holes for mounting into the floor. 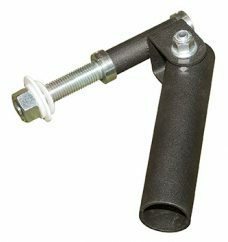 Standard are Patriot Deluxe Bar Catches with 34 adjustments per upright. The catch is a “sandwich” style bar catch with 1” thick ultra-high dense plastic in the middle. The metal is lasered cut and formed. The bar rests on the plastic and never the metal. 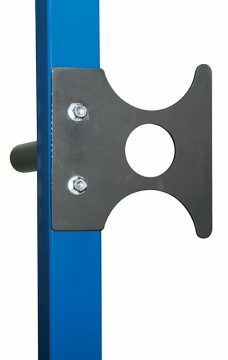 The lifter has 3” of plastic to rest the bar. The interior of the catch is protected from the upright with a plastic sleeve . The catch is painted matte crinkle black. The Monkey Chin Bar with Extended Porch (72 lbs.). The Monkey Chin Bar provides the ultimate body weight experience. 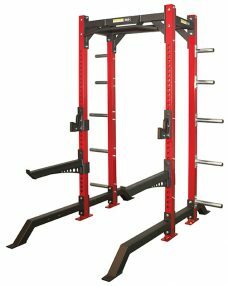 The design incorporates 2 chin bars of different sizes and 4 parallel grip areas. The front & back chin bars are of different diameters. 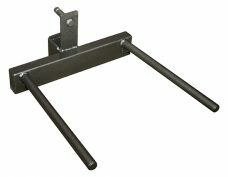 The front bar is 1”-3/8 diameter; the back bar, or ‘fat bar’ is 2” diameter. The bar is 42” wide. The parallel grips are spaced 10” & 24” apart. 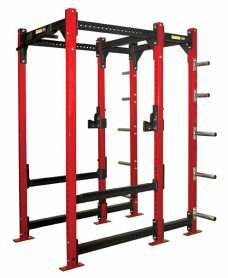 The extended porch area allows the Monkey Bar to be attached in front of the rack, as opposed to the interior of the rack, this allows more interior room & exercise combinations. The Porch also has pre-drilled holes for utility pin attachments. The Monkey Bar can be mounted ‘upside down’. Painted matte crinkle black for grip & durability. Standard are ten (10) zinc plated weight horns that bolt to the back uprights. Bumper plates will fit on the lower 3 weight horn pins. The Bottom 3 weigh horn pins are 12” long and the top 2 pins are 6” long. 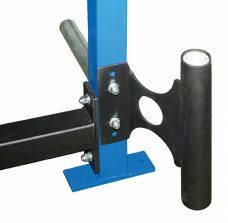 Standard are two (2) heavy duty safety bars (safeties are painted matte crinkle black). Each bar is 29” in length. 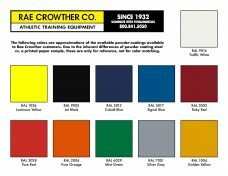 Each safety has hard plastic protection on the top and side of the metal. The plastic is secured with 2 metal rivets. Each safety is made from 3” structural steel tubing and gusseted for extra strength. Painted in matte crinkle black. 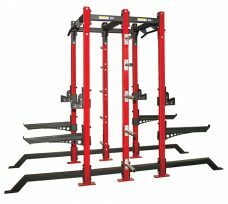 The connectors on the rack are heavily gusseted with 3” square tubing and ½ thick endplates. 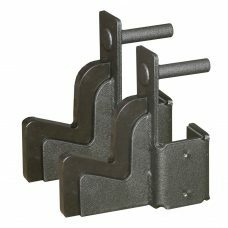 These heavy gussets with large oversized endplates are what make the rack very-very rigid. All gussets and braces are painted matte crinkle black.